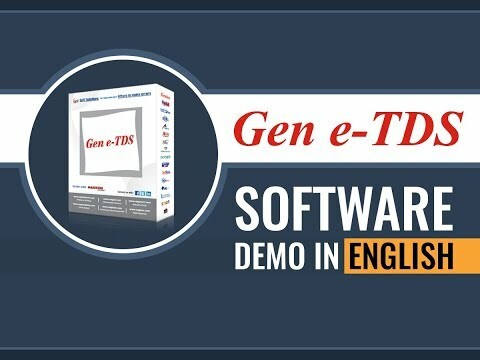 GEN e-TDS software has been exclusively designed for the filing of TDS/TCS returns online as per the norms of TRACES and CPC, India. This software is consistent with easy to use interface. It allows the user to premeditate the TDS amount helping in calculating the TDS returns, calculate Interest and penalty along with late filing fees. It is an approved TDS software with listings on the government of India’s official Tax Information Network website. GEN TDS allow users to submit & prepare quarterly & yearly TDS statements. E-Registration facility is also available. It allows to users to submit correction statements on TRACES. Allow users to view & use unconsumed challan of any period to selected period. Q. What is annual e-TDS/TCS Return and whether it can be filled from your software? Q. What is quarterly e-TDS/TCS statement and whether it can be prepared by this software? Yes. TDS/TCS returns filed in electronic form as per section 200(3)/206C, as amended by Finance Act, 2005, are quarterly TDS/TCS statements. As per the Income Tax Act, these quarterly statements are required to be furnished from FY 2005-06 onwards. The forms used for quarterly e-TDS statements are Form Nos. 24Q, 26Q and 27Q and for quarterly e-TCS statement is Form No. 27EQ. These statements filed in CD/Pen Drive should be accompanied by a signed verification in Form No. 27A in case of both e-TDS/TCS statements. Q. What is Form No. 27A? Form No. 27A is a control chart of quarterly e-TDS/TCS statements to be filed in paper form by deductors/collectors along with quarterly statements. It is a summary of e-TDS/TCS returns which contains control totals of 'amount paid' and 'income tax deducted at source'. The control totals of 'amount paid' and 'income tax deducted at source' mentioned on Form No. 27A should match with the corresponding control totals in e-TDS/TCS return. A separate Form No. 27A is to be filed for each e-TDS/TCS return. In case of Annual Returns the relevant control charts are Form 27A for e-TDS and Form 27B for e-TCS. Q. By whom should the control chart Form 27A be signed? Form 27A is an essence of the TDS/TCS statement. It is signed by the same person who is authorized to sign the TDS/TCS statement in paper format. Q. What is the data structure (file format) for preparing e-TDS/TCS return? e-TDS/TCS should be prepared by the e-filing administrator in accordance with the prescribed data structure. And, separate data structure is prescribed for each type of form whether it is Quarterly return (FY 2005-06 onwards) or annual return (up to FY 2004-05).